1. Describe how Pavlov’s early work in classical conditioning influenced the understanding of learning. 2. Review the concepts of classical conditioning, including unconditioned stimulus (US), conditioned stimulus (CS), unconditioned response (UR), and conditioned response (CR). 3. Explain the roles that extinction, generalization, and discrimination play in conditioned learning. 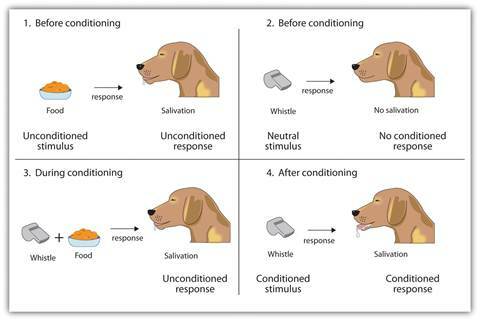 As you can see in Figure 7.3 "4-Panel Image of Whistle and Dog", psychologists use specific terms to identify the stimuli and the responses in classical conditioning. The unconditioned stimulus (US) is something (such as food) that triggers a natural occurring response, and the unconditioned response (UR) is the naturally occurring response (such as salivation) that follows the unconditioned stimulus. The conditioned stimulus (CS) is a neutral stimulus that, after being repeatedly presented prior to the unconditioned stimulus, evokes a similar response as the unconditioned stimulus. In Pavlov’s experiment, the sound of the tone served as the conditioned stimulus that, after learning, produced the conditioned response (CR), which is the acquired response to the formerly neutral stimulus. Note that the UR and the CR are the same behavior—in this case salivation—but they are given different names because they are produced by different stimuli (the US and the CS, respectively). After he had demonstrated that learning could occur through association, Pavlov moved on to study the variables that influenced the strength and the persistence of conditioning. In some studies, after the conditioning had taken place, Pavlov presented the sound repeatedly but without presenting the food afterward. Figure 7.4 "Acquisition, Extinction, and Spontaneous Recovery"shows what happened. As you can see, after the intial acquisition (learning) phase in which the conditioning occurred, when the CS was then presented alone, the behavior rapidly decreased—the dogs salivated less and less to the sound, and eventually the sound did not elicit salivation at all. Extinctionrefers to the reduction in responding that occurs when the conditioned stimulus is presented repeatedly without the unconditioned stimulus. Lewicki (1985)  conducted research that demonstrated the influence of stimulus generalization and how quickly and easily it can happen. In his experiment, high school students first had a brief interaction with a female experimenter who had short hair and glasses. The study was set up so that the students had to ask the experimenter a question, and (according to random assignment) the experimenter responded either in a negative way or a neutral way toward the students. Then the students were told to go into a second room in which two experimenters were present, and to approach either one of them. However, the researchers arranged it so that one of the two experimenters looked a lot like the original experimenter, while the other one did not (she had longer hair and no glasses). The students were significantly more likely to avoid the experimenter who looked like the earlier experimenter when that experimenter had been negative to them than when she had treated them more neutrally. The participants showed stimulus generalization such that the new, similar-looking experimenter created the same negative response in the participants as had the experimenter in the prior session. As we have seen in Chapter 1 "Introducing Psychology", scientists associated with the behavioralist school argued that all learning is driven by experience, and that nature plays no role. Classical conditioning, which is based on learning through experience, represents an example of the importance of the environment. But classical conditioning cannot be understood entirely in terms of experience. Nature also plays a part, as our evolutionary history has made us better able to learn some associations than others. PTSD develops because the emotions experienced during the event have produced neural activity in the amygdala and created strong conditioned learning. In addition to the strong conditioning that people with PTSD experience, they also show slower extinction in classical conditioning tasks (Milad et al., 2009). In short, people with PTSD have developed very strong associations with the events surrounding the trauma and are also slow to show extinction to the conditioned stimulus. · In classical conditioning, a person or animal learns to associate a neutral stimulus (the conditioned stimulus, or CS) with a stimulus (the unconditioned stimulus, or US) that naturally produces a behavior (the unconditioned response, or UR). As a result of this association, the previously neutral stimulus comes to elicit the same response (the conditioned response, or CR). · Extinction occurs when the CS is repeatedly presented without the US, and the CR eventually disappears, although it may reappear later in a process known as spontaneous recovery. · Stimulus generalization occurs when a stimulus that is similar to an already-conditioned stimulus begins to produce the same response as the original stimulus does. · Stimulus discrimination occurs when the organism learns to differentiate between the CS and other similar stimuli. · In second-order conditioning, a neutral stimulus becomes a CS after being paired with a previously established CS. · Some stimuli—response pairs, such as those between smell and food—are more easily conditioned than others because they have been particularly important in our evolutionary past. 1. A teacher places gold stars on the chalkboard when the students are quiet and attentive. Eventually, the students start becoming quiet and attentive whenever the teacher approaches the chalkboard. Can you explain the students’ behavior in terms of classical conditioning? 2. Recall a time in your life, perhaps when you were a child, when your behaviors were influenced by classical conditioning. Describe in detail the nature of the unconditioned and conditioned stimuli and the response, using the appropriate psychological terms. 3. If posttraumatic stress disorder (PTSD) is a type of classical conditioning, how might psychologists use the principles of classical conditioning to treat the disorder? Öhman, A., & Mineka, S. (2001). Fears, phobias, and preparedness: Toward an evolved module of fear and fear learning. Psychological Review, 108(3), 483–522; LoBue, V., & DeLoache, J. S. (2010). Superior detection of threat-relevant stimuli in infancy.Developmental Science, 13(1), 221–228. Garcia, J., Kimeldorf, D. J., & Koelling, R. A. (1955). Conditioned aversion to saccharin resulting from exposure to gamma radiation. Science, 122, 157–158; Garcia, J., Ervin, F. R., & Koelling, R. A. (1966). Learning with prolonged delay of reinforcement. Psychonomic Science, 5(3), 121–122. 1. Outline the principles of operant conditioning. 2. Explain how learning can be shaped through the use of reinforcement schedules and secondary reinforcers. In classical conditioning the organism learns to associate new stimuli with natural, biological responses such as salivation or fear. The organism does not learn something new but rather begins to perform in an existing behavior in the presence of a new signal. Operant conditioning, on the other hand, is learning that occurs based on the consequences of behavior and can involve the learning of new actions. Operant conditioning occurs when a dog rolls over on command because it has been praised for doing so in the past, when a schoolroom bully threatens his classmates because doing so allows him to get his way, and when a child gets good grades because her parents threaten to punish her if she doesn’t. In operant conditioning the organism learns from the consequences of its own actions. Psychologist Edward L. Thorndike (1874–1949) was the first scientist to systematically study operant conditioning. In his research Thorndike (1898) observed cats who had been placed in a “puzzle box” from which they tried to escape (Note 7.21 "Video Clip: Thorndike’s Puzzle Box"). At first the cats scratched, bit, and swatted haphazardly, without any idea of how to get out. But eventually, and accidentally, they pressed the lever that opened the door and exited to their prize, a scrap of fish. The next time the cat was constrained within the box it attempted fewer of the ineffective responses before carrying out the successful escape, and after several trials the cat learned to almost immediately make the correct response. Observing these changes in the cats’ behavior led Thorndike to develop hislaw of effect, the principle that responses that create a typically pleasant outcome in a particular situation are more likely to occur again in a similar situation, whereas responses that produce a typically unpleasant outcome are less likely to occur again in the situation (Thorndike, 1911). The essence of the law of effect is that successful responses, because they are pleasurable, are “stamped in” by experience and thus occur more frequently. Unsuccessful responses, which produce unpleasant experiences, are “stamped out” and subsequently occur less frequently. When Thorndike placed his cats in a puzzle box, he found that they learned to engage in the important escape behavior faster after each trial. Thorndike described the learning that follows reinforcement in terms of the law of effect. The influential behavioral psychologist B. F. Skinner (1904–1990) expanded on Thorndike’s ideas to develop a more complete set of principles to explain operant conditioning. Skinner created specially designed environments known as operant chambers (usually called Skinner boxes) to systemically study learning. A Skinner box (operant chamber) is a structure that is big enough to fit a rodent or bird and that contains a bar or key that the organism can press or peck to release food or water. It also contains a device to record the animal’s responses. The most basic of Skinner’s experiments was quite similar to Thorndike’s research with cats. A rat placed in the chamber reacted as one might expect, scurrying about the box and sniffing and clawing at the floor and walls. Eventually the rat chanced upon a lever, which it pressed to release pellets of food. The next time around, the rat took a little less time to press the lever, and on successive trials, the time it took to press the lever became shorter and shorter. Soon the rat was pressing the lever as fast as it could eat the food that appeared. As predicted by the law of effect, the rat had learned to repeat the action that brought about the food and cease the actions that did not. Skinner studied, in detail, how animals changed their behavior through reinforcement and punishment, and he developed terms that explained the processes of operant learning (Table 7.1 "How Positive and Negative Reinforcement and Punishment Influence Behavior"). Skinner used the termreinforcer to refer to any event that strengthens or increases the likelihood of a behavior and the term punisher to refer to any event that weakens or decreases the likelihood of a behavior. And he used the terms positive andnegative to refer to whether a reinforcement was presented or removed, respectively. Thus positive reinforcement strengthens a response by presenting something pleasant after the response andnegative reinforcement strengthens a response by reducing or removing something unpleasant. For example, giving a child praise for completing his homework represents positive reinforcement, whereas taking aspirin to reduced the pain of a headache represents negative reinforcement. In both cases, the reinforcement makes it more likely that behavior will occur again in the future. Reinforcement, either positive or negative, works by increasing the likelihood of a behavior. Punishment, on the other hand, refers to any event that weakens or reduces the likelihood of a behavior. Positive punishment weakens a response by presenting something unpleasant after the response, whereasnegative punishment weakens a response by reducing or removing something pleasant. A child who is grounded after fighting with a sibling (positive punishment) or who loses out on the opportunity to go to recess after getting a poor grade (negative punishment) is less likely to repeat these behaviors. Although the distinction between reinforcement (which increases behavior) and punishment (which decreases it) is usually clear, in some cases it is difficult to determine whether a reinforcer is positive or negative. On a hot day a cool breeze could be seen as a positive reinforcer (because it brings in cool air) or a negative reinforcer (because it removes hot air). In other cases, reinforcement can be both positive and negative. One may smoke a cigarette both because it brings pleasure (positive reinforcement) and because it eliminates the craving for nicotine (negative reinforcement). It is also important to note that reinforcement and punishment are not simply opposites. The use of positive reinforcement in changing behavior is almost always more effective than using punishment. This is because positive reinforcement makes the person or animal feel better, helping create a positive relationship with the person providing the reinforcement. Types of positive reinforcement that are effective in everyday life include verbal praise or approval, the awarding of status or prestige, and direct financial payment. Punishment, on the other hand, is more likely to create only temporary changes in behavior because it is based on coercion and typically creates a negative and adversarial relationship with the person providing the reinforcement. When the person who provides the punishment leaves the situation, the unwanted behavior is likely to return. Perhaps you remember watching a movie or being at a show in which an animal—maybe a dog, a horse, or a dolphin—did some pretty amazing things. The trainer gave a command and the dolphin swam to the bottom of the pool, picked up a ring on its nose, jumped out of the water through a hoop in the air, dived again to the bottom of the pool, picked up another ring, and then took both of the rings to the trainer at the edge of the pool. The animal was trained to do the trick, and the principles of operant conditioning were used to train it. But these complex behaviors are a far cry from the simple stimulus-response relationships that we have considered thus far. How can reinforcement be used to create complex behaviors such as these? One way to expand the use of operant learning is to modify the schedule on which the reinforcement is applied. To this point we have only discussed a continuous reinforcement schedule, in which the desired response is reinforced every time it occurs; whenever the dog rolls over, for instance, it gets a biscuit. Continuous reinforcement results in relatively fast learning but also rapid extinction of the desired behavior once the reinforcer disappears. The problem is that because the organism is used to receiving the reinforcement after every behavior, the responder may give up quickly when it doesn’t appear. Most real-world reinforcers are not continuous; they occur on a partial (or intermittent) reinforcement schedule—a schedule in which the responses are sometimes reinforced, and sometimes not. In comparison to continuous reinforcement, partial reinforcement schedules lead to slower initial learning, but they also lead to greater resistance to extinction. Because the reinforcement does not appear after every behavior, it takes longer for the learner to determine that the reward is no longer coming, and thus extinction is slower. The four types of partial reinforcement schedules are summarized in Table 7.2 "Reinforcement Schedules". Partial reinforcement schedules are determined by whether the reinforcement is presented on the basis of the time that elapses between reinforcement (interval) or on the basis of the number of responses that the organism engages in (ratio), and by whether the reinforcement occurs on a regular (fixed) or unpredictable (variable) schedule. In a fixed-interval schedule,reinforcement occurs for the first response made after a specific amount of time has passed. For instance, on a one-minute fixed-interval schedule the animal receives a reinforcement every minute, assuming it engages in the behavior at least once during the minute. As you can see in Figure 7.7 "Examples of Response Patterns by Animals Trained Under Different Partial Reinforcement Schedules", animals under fixed-interval schedules tend to slow down their responding immediately after the reinforcement but then increase the behavior again as the time of the next reinforcement gets closer. (Most students study for exams the same way.) In a variable-interval schedule,the reinforcers appear on an interval schedule, but the timing is varied around the average interval, making the actual appearance of the reinforcer unpredictable. An example might be checking your e-mail: You are reinforced by receiving messages that come, on average, say every 30 minutes, but the reinforcement occurs only at random times. Interval reinforcement schedules tend to produce slow and steady rates of responding. Schedules based on the number of responses (ratio types) induce greater response rate than do schedules based on elapsed time (interval types). Also, unpredictable schedules (variable types) produce stronger responses than do predictable schedules (fixed types). Source: Adapted from Kassin, S. (2003). Essentials of psychology. Upper Saddle River, NJ: Prentice Hall. Retrieved from Essentials of PsychologyPrentice Hall Companion Website:http://wps.prenhall.com/hss_kassin_essentials_1/15/3933/1006917.cw/index.html. In a fixed-ratio schedule, a behavior is reinforced after a specific number of responses. For instance, a rat’s behavior may be reinforced after it has pressed a key 20 times, or a salesperson may receive a bonus after she has sold 10 products. As you can see in Figure 7.7 "Examples of Response Patterns by Animals Trained Under Different Partial Reinforcement Schedules", once the organism has learned to act in accordance with the fixed-reinforcement schedule, it will pause only briefly when reinforcement occurs before returning to a high level of responsiveness. A variable-ratio schedule provides reinforcers after a specific but average number of responses. Winning money from slot machines or on a lottery ticket are examples of reinforcement that occur on a variable-ratio schedule. For instance, a slot machine may be programmed to provide a win every 20 times the user pulls the handle, on average. As you can see in Figure 7.8 "Slot Machine", ratio schedules tend to produce high rates of responding because reinforcement increases as the number of responses increase. Complex behaviors are also created through shaping, the process of guiding an organism’s behavior to the desired outcome through the use of successive approximation to a final desired behavior. Skinner made extensive use of this procedure in his boxes. For instance, he could train a rat to press a bar two times to receive food, by first providing food when the animal moved near the bar. Then when that behavior had been learned he would begin to provide food only when the rat touched the bar. Further shaping limited the reinforcement to only when the rat pressed the bar, to when it pressed the bar and touched it a second time, and finally, to only when it pressed the bar twice. Although it can take a long time, in this way operant conditioning can create chains of behaviors that are reinforced only when they are completed. Behaviors can also be trained through the use of secondary reinforcers. Whereas a primary reinforcer includes stimuli that are naturally preferred or enjoyed by the organism, such as food, water, and relief from pain, a secondary reinforcer (sometimes called conditioned reinforcer) is a neutral event that has become associated with a primary reinforcer through classical conditioning. An example of a secondary reinforcer would be the whistle given by an animal trainer, which has been associated over time with the primary reinforcer, food. An example of an everyday secondary reinforcer is money. We enjoy having money, not so much for the stimulus itself, but rather for the primary reinforcers (the things that money can buy) with which it is associated. · Edward Thorndike developed the law of effect: the principle that responses that create a typically pleasant outcome in a particular situation are more likely to occur again in a similar situation, whereas responses that produce a typically unpleasant outcome are less likely to occur again in the situation. · B. F. Skinner expanded on Thorndike’s ideas to develop a set of principles to explain operant conditioning. · Positive reinforcement strengthens a response by presenting something that is typically pleasant after the response, whereas negative reinforcement strengthens a response by reducing or removing something that is typically unpleasant. · Positive punishment weakens a response by presenting something typically unpleasant after the response, whereas negative punishment weakens a response by reducing or removing something that is typically pleasant. · Reinforcement may be either partial or continuous. Partial reinforcement schedules are determined by whether the reinforcement is presented on the basis of the time that elapses between reinforcements (interval) or on the basis of the number of responses that the organism engages in (ratio), and by whether the reinforcement occurs on a regular (fixed) or unpredictable (variable) schedule. · Complex behaviors may be created through shaping, the process of guiding an organism’s behavior to the desired outcome through the use of successive approximation to a final desired behavior. 1. Give an example from daily life of each of the following: positive reinforcement, negative reinforcement, positive punishment, negative punishment. 2. Consider the reinforcement techniques that you might use to train a dog to catch and retrieve a Frisbee that you throw to it. 3. Watch the following two videos from current television shows. Can you determine which learning procedures are being demonstrated? Thorndike, E. L. (1898). Animal intelligence: An experimental study of the associative processes in animals. Washington, DC: American Psychological Association. Cerella, J. (1980). The pigeon’s analysis of pictures. Pattern Recognition, 12, 1–6. Porter, D., & Neuringer, A. (1984). Music discriminations by pigeons. Journal of Experimental Psychology: Animal Behavior Processes, 10(2), 138–148; Watanabe, S., Sakamoto, J., & Wakita, M. (1995). Pigeons’ discrimination of painting by Monet and Picasso. Journal of the Experimental Analysis of Behavior, 63(2), 165–174.